The banged-up Detroit Red Wings, playing without stars Nicklas Lidström and Pavel Datsyuk, have eliminated the Chicago Blackhawks after a 2-1 overtime victory in Game 5 of the Western Conference finals. 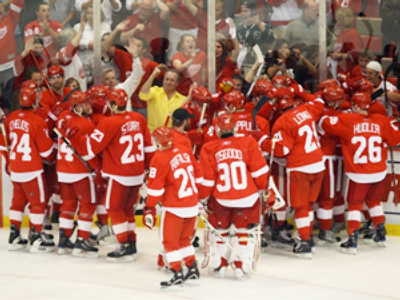 In the absence of its leaders, Dan Cleary and Darren Helm took the reins in their hands. The first opened the scoring in the second period, not for a long time though, while the second scored a series-winner three minutes into overtime. “Well I think we should all be proud of the year we had. It was a great group to work with. These kids have been great all year long. They matured and they developed. It is a great working experience. We got to find out what playoff hockey is all about,” Chicago coach Joel Guerneville shared after the game. The victory let the Red Wings make it to the Stanley Cup Finals, where the Best-in-the-East Pittsburgh Penguins are awaiting last year’s champions. ”To us it's fun, we enjoy this time of year. We enjoy the opportunity to play against Pittsburgh and it's going to be a lot of fun,” Babcock added.